July 10th 1940, in Fairlight, outside Hastings on the English channel coast – the fast approaching hum of the German Messerschmitt Bf 109E and Bf 110C heralds the beginning of the Battle of Britain, the epic fight between the German Luftwaffe and the RAF, the Royal Air Force. The RAF’s HURRICANE, the trustworthy “workhorse” of the British airforce bore the brunt of the battle that lasted from July 10th 1940 to October 31st 1940. A solidly built single engine aircraft equipped with eight Browning 303 machine guns the HURRICANE proved a formidable foe despite being slower than the German Messerschmitt. Generally the RAF’s Spitfire would intercept the German fighters, leaving HURRICANES to concentrate on the bombers, but despite the undoubted abilities of the "thoroughbred" Spitfire, it was the HURRICANE that scored the highest number of RAF victories during this period. The HURRICANE - RAF's forgotten fighter star of the Battle of Britain, the plane “never known to fail”. To commemorate the HURRICANE and the brave pilots who fought and fell with them we are proud to introduce our new pilot’s watch, the aptly named “HURRICANE” on this the 70th anniversary of the beginning of the Battle of Britain. Based on our AIRFORCE I model the HURRICANE by CX Swiss Military Watch™ is equipped with the chronometer certified ETA cal. 7750 COSC and sets a new standard in its class: the stainless steel case, highly scratch resistant due to the DLC (diamond-like) black coating houses a bezel designed as a fully functional circular slide rule and is anti-magnetic as per ISO 764. The bezel allows for all relevant aeronautical calculations. 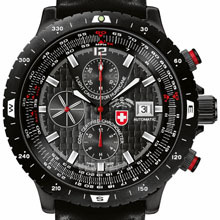 The anti-reflective sapphire crystal protects a rugged dial evoking the artificial horizon in a cockpit. The small second hand is constructed in the shape of a propeller, relentlessly churning away against the tide of time. The nanotech Swiss Made® leather strap is a new development, nearly impermeable and thus exceptionally long-lasting. The solid stainless steel buckle – also in DLC – bears the CX Swiss Military Watch™ logo and is as indestructible as the watch itself. The oversized pilot’s crown and the pushers are screw-down and the HURRICANE is water resistant to 200 meters. 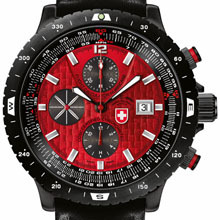 The red color of the pushers disappears once they are screwed-in and the watch thus fully water resistant. The HURRICANE is available in four dial colors - silver, black, RAF red and arctic blue – and is sold in a luxurious wooden gift box.